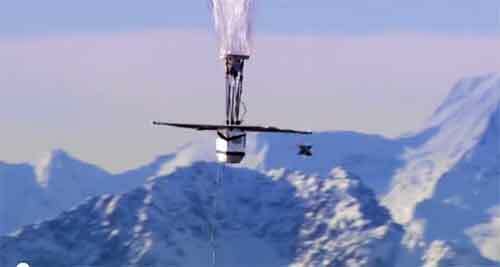 Internet service for everyone anywhere, anyplace through Google balloons update. Remember when Google huggged technology news during its launching of a limited number of balloons down under, in New Zealand? That was its project launch in 2013 which now the search giant claim have flown already millions of test miles around the world to learn the basics in providing connectivity for everyone anywhere, anyplace. Here is another update on that giant and ambitious program, a video on how Google is gearing its realization with Project Loon lead Mike Cassidy. The project team posted the video on the nitty gritty stuff they do. Find out more as the great effort is becoming into near reality. After two years, the team afford prying eyes a look-see at how they will manage the balloon fleet, the capability to build balloons in hours and launch a fleet every day for up to 100-days. Photograb of Google balloon navigating its way in snow capped New Zealand, in an ambitious Project Loon to provide internet connectivity for everyone, anywhere, anyplace.. This entry was posted in INTERNET, NEWS, TECH NEWS, VIDEO and tagged internet. Bookmark the permalink.